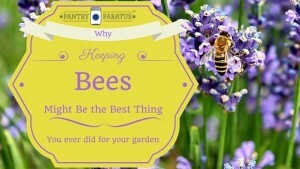 We cannot say that we have done it all on our homestead, but we have bravely cared for chickens, ducks, a goose (who may not acknowledge that relationship), goats, earth worms, and now honey bees. Homesteading is not cheap, nor is it easy. It is fulfilling, and at times heart breaking. At the end of July, I spent the better part of our Emergency Room’s night shift with Chaya as she recovered from what we can guess to be about 100+ bee stings. One bee sting is annoying, 25 can make church lady curse, and 75 (more likely 100) about the head and neck of a person is enough to put them in the care of medical professionals. The events of that fateful evening started by Chaya smoking the entrance of the hive so that she could remove one frame. She was trying to help the hive vent because they were swarming around the front of the entrance in the evening, a sign of overheating. The bees started to sting her through the suit. Mostly, the stings were to the top of the head where the hat just rests like a thin veil. She ran away, but they pursued her. Several got into her hood, too, so she removed the suit hood to spray herself off with the hose; it seemed the attack was over, but a second round came at her. I came home to find her on the kitchen floor singing the Lord’s Prayer with stingers all over her face, scalp, and neck…and barely conscious. It is important to note that Italian honeybees are typically not aggressive. Most of the time you would not even know that they were there except that everything that blooms looks so much prettier. Many people work with hives without a full suit. We put two hives side-by-side behind the shed, but it became increasingly clear that they were very different hives. The look or behavior of the bee can indicate something is wrong, but only a molecular biology test can verify what we really know: that the one docile hive is the Italian honey bees that we ordered, while the other was an Africanized strain. That particular genetic strain of bees are known for life-threatening aggression—hence Chaya’s trip to the Emergency Room. There were other warning signs that we didn’t properly read, having been told that Africanized honey bees aren’t a problem in Montana due to our harsh winters. We did not factor that our purchased bees had been imported. I have heard Paul Wheaton say in a podcast, “When you take an animal into your care, you become responsible for its welfare.” Well, when you take 30,000 animals into your care, you have a whole lot of responsibility, and truthfully, honey bees are usually pretty easy to charm. These bees would not be dissuaded from the aggression that they so easily expressed. Since I do not only have honey bees, but children, I need to negotiate a peace. We put in two emergency calls: one to the county extension agency and the other to the state entomologist. Both said that the erratic behavior of this hive from Day 1 sounded Africanized, but in any case, the hive must be destroyed for the safety of our family and others. Peanut (8 years old) working the docile hive; the one that attacked is next to it on the left. 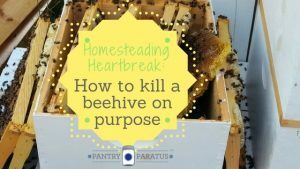 In this case it involves doing the needful, heart breaking chore of killing off the whole hive. There just was not any other way but to kill a beehive on purpose. I cannot come to peace with the fact that it had to be done and that it means that I have failed in some serious aspect of honey bee husbandry. Yet, I am unwilling to have my child(ren) subjected to that pain. Peanut helps Chaya with the bee keeping, but thank God he was away at camp this particular week. All of the comb, all of the brood, all of the wax and yes the liquid gold of the honey as well had to go. I salvaged the hive body itself, but not much else is going to be salvageable, sadly. The method that I read about on the USDA website uses Palmolive dish soap in a weed sprayer set up, and it is remarkably effective. The mild soap evidently strips the bees of their waxy coat and they die. I learned about the National Park Service doing this with an old fire truck to fight the wood boring insects when I went to Smokey Mountain National Park years ago. 1. Question: Why dish soap, can you not just use insecticide? Answer: Sure, there are methods that do this exclusively. In fact, poison was recommended to us in one of those emergency calls we made to “the professionals.” My warning would be that a respirator would be best but not comfortable or likely under your bee hood (depending on your kind). Besides, there inevitably will be “clean up” required, and it is super handy to have soapy water on hand to do that. Also, we have another hive right next to it! Lastly, I wanted to save the hive body so that I could put bees in it next year rather than using something designed to kill bees that would inevitably leave a residue on the equipment. 2. Question: Did you protect yourself in any special way? Answer: Not sure about “special,” but here is what I did. I put on thick double front work jeans and taped the cuffs down over the western style boot tops. 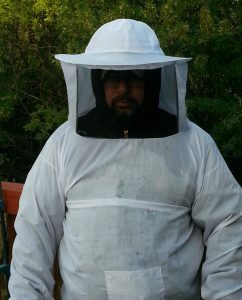 Seeing that the bees had characteristically attacked Chaya’s head and neck, I put on my thick winter coat and taped the bottom edge, pulled the hood up and put the bee suit over it. I then put on gloves and triple taped the cuffs. When I was doing all of this, Chaya was able to observe (safely from the house) a swarm of bees on my back and head, but I was safe inside the modified suit. Although they also “attacked” me, I didn’t get a single sting with all of my layers. 3. Question: How did it go? 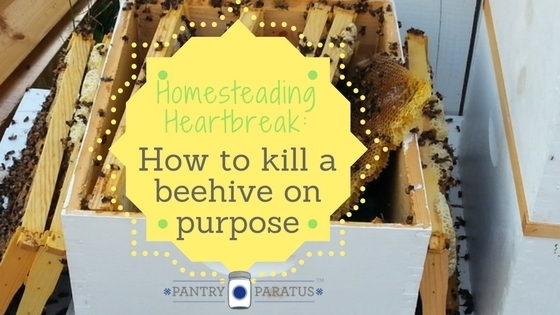 Answer: The heart sickening chore of having to kill off a whole hive went remarkably quick. I used a (new) 2 gallon weed sprayer from Lowes, filled it with near boiling water and half a bottle of the recommended Palmolive dish soap. Note: add the dish soap after the water, or else you will have a huge foam situation on your hands. Once I was at the hive, I started to spray the bees at the entrance first. 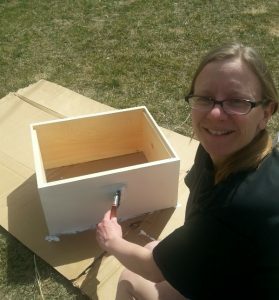 Eventually, I had to lift up the lid, and I inserted the sprayer wand first, then lifted it totally off and began spraying anything that moved. As stated, the dish soap is remarkably effective, so much so that towards the end I was able to get a few lucky shots with the onsie-twosies that were left flying around—if I could hit them in the air, then went down and died shortly after. This seemed pretty humane for the level of destruction that we are talking about here. I lifted up each frame and sprayed anything that moved until there was nothing moving any longer, it was a total loss. 4. Question: Would you do anything different next time? Answer: Yes, I would order mated queens from northern bee suppliers only. These queens were from California (nothing against the Golden State here). One of our two queens most likely have the africanized genetics, and so her offspring did as well. Thus the whole hive had to be destroyed. The state entomologist for Montana says that Africanized bees are not a problem here because our winters are too harsh for them. Well, that may be true from year to year, but these bees were bred and raised in one year—hence the all nighter with the ER staff. Chaya reminds me that for as hard as it was to kill a beehive, they were not only dangerous to society but would have likely died naturally on their own once the season changed. 5. Question: Was there anything about this that struck you as funny? Answer: Yes. When I was attending to Chaya on the kitchen floor, there were still live bees in the house. I was swatting them with the nearest book I could find, entitled, Save the Bees. It is a great book with beautiful photographs and written by passionate beekeepers who seek to inspire future beekeepers—but at the time, it was a sure means of transferring sufficient momentum to the bees in my house to ensure their demise. We have every intention, in spite of Chaya’s close call, to continue our beekeeping endeavors. We believe in the bees. Thank goodness she survived .. thank you for the very informative article. 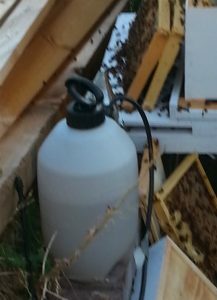 Hello- I’m curious as to why the honey and wax had to be destroyed/thrown out as well, but the hive was safe to keep? 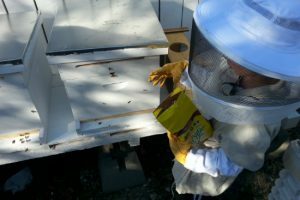 I’m just starting in on beekeeping endeavors, so please forgive me if that’s a “silly question”! Not a silly question at all…and some are suggesting to us now that there might have been a way to destroy the hive with CO2 and sealing it, in order to save everything. Of course, we were in a time crunch to deal with this before more tragedy, and we found limited information online. Perhaps the wax could have been saved in hindsight, but since we don’t make candles etc., I wouldn’t honestly know! The honey was certainly ruined by the soap. You are right that you don’t understand. They did not sting our family member one time, nor was the family member unprotected. They were always aggressive and we were repeatedly stung by this hive whenever we went near them (yes, even in bee suits). They attacked through the bee suit, landing me in the hospital. They were not safe and we were instructed to destroy them immediately. Monika, the bees are not getting reduced worldwide because someone decided to kill a bee hive or two. Bees are dying because we are constantly poisoning the air and killing the plants they feed on. Believe me, it’s really dangerous for little children with allergies to be in a close proximity to a bee hive. Thank you for this post. It led me to the Wikipedia article on Africanized bees, more commonly known as “killer bees” because of how viciously they attack humans and how many people have been killed in their attacks. The article also notes that they are an invasive species, which we should not encourage. For Monika, I think a fair comparison would be if your family got two cats from a shelter. One was nice if you petted it gently, but the other one scratched, bit, and chased down your children if they went near it. Later you found out that the second cat was actually a wild bobcat, and it could never be trained to be nice and domestic. You would not let that wild bobcat stay in your home and endanger your family. I have a hive that is acting the same way here in idaho. I have been stung multiple times through my suit and my suit is COVERED by stingers. I have also made the decision that I have to kill this hive. Hello and thank you a ton for this post. I have an unmanageable colony and I unfortunately am going to have to deal with them. My question is, is the woodenware reusable after spraying them with soapy water?? I would hate to lose all 40 frames if I can scrape them and reuse them. I have an out of control hive. Only one of 6. I do not know what to do except try what you tried. I don’t want to breathe pesticides or get pesticide in other nearby beehives. Not advocating killing bees either but yes, there is a big responsibility to your family and neighbors specially if time to re-queening is not on your side you may have no choice but to eradicate them. I am losing my dog to an overly aggressive hive that I thought would be requeened to alter the genetics. Since I have a ggson here I am no longer willing to “postpone” and hope that the new queen would help. So I will use your soapy water trick and overload myself with padding before attempting anything. If the honey is capped, why would the soapy water get into it. I presume you used boiling water which then would melt or at least soften the wax. This is my first year with this hive and I will lose almost 100 lbs of honey, but better than my ggson.